How to make it: https://www.raspiaudio.com/lovebirds and https://www.instructables.com/id/Love-Birds-a-Box-to-Send-and-Receive-Telegram-Audi/ It’s a standalone device that receives send voice messages to your love, family or friend. Open the box, push the button while you are talking, release to send the audio message. “OK, my phone can already do that, why should I bother?” project creator Olivier Ros asks himself in the introduction to his Instructables tutorial. And his response is simple. While you could use a phone, the magic of Love Birds is the intention behind the action. Mobile phones are where your life exists: your banking details, your work conversations, and more. It’s always on your person, probably in your hand right now. But with Love Birds, you have to make the effort to use the device to send that heartfelt message to the recipient. You’ll need one Raspberry Pi per Love Bird device; while Olivier’s version contains a Pi Zero W, a Raspberry Pi 2 or 3 will also do the trick. You’ll also need a microphone and speakers. And, lucky for us, Raspiaudio offers a HAT that incorporates the two! You can find similar boards from other Raspberry Pi accessory manufacturers, or use a standard USB microphone and speaker, readily available in stores and online. To make the notification birds dance, you also need a servo motor. The full code for the motors and everything else is available on GitHub. As an alternative to the motor, you could try flashing LEDs or playing a sound as a notification; we’re always interested in seeing how people add their own flair to open-source projects. You also need to sign up to Telegram in order to send your voice messages securely over the internet. Again, there are other services available, which you can use by editing the code accordingly. Find the full Instructables tutorial here, and visit the Raspiaudio website for more projects! 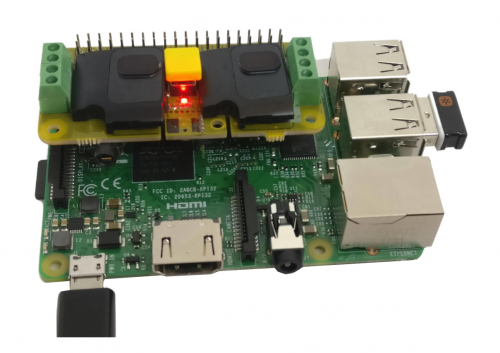 How will you be using a Raspberry Pi to celebrate Valentine’s Day?